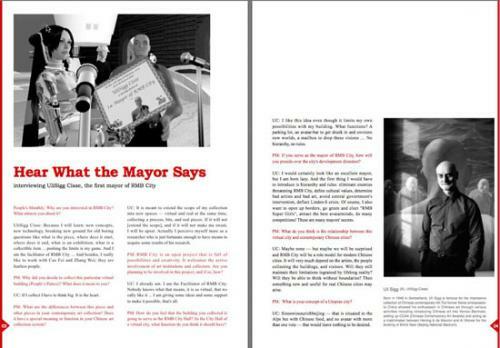 What does utopia mean in the mind of RMB City’s first mayor (SL:UliSigg Cisse)? 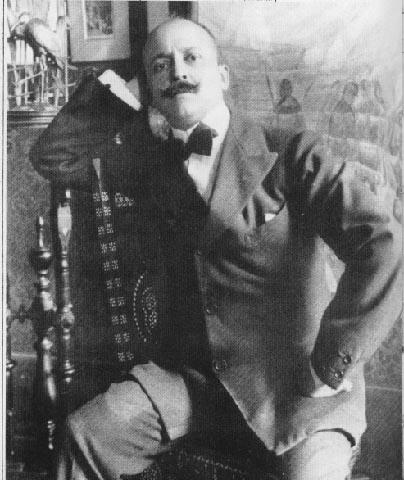 What are the SL dreams of some international, accomplished curators? 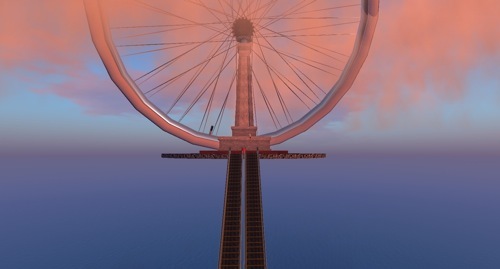 What do SL architects think about RL architecture? 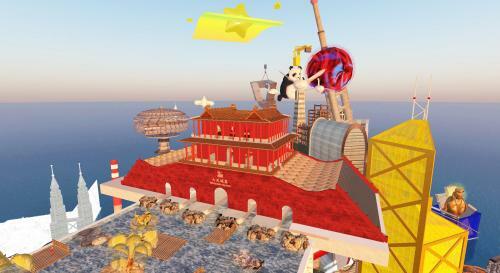 Find the answers of the above questions in People’s Monthly – RMB City’s official newsletter – that contains inspiring discourses connceting RMB City, urbanism, SL, Virtual worlds, art, utopia … in a neatly-designed, tiny publication. 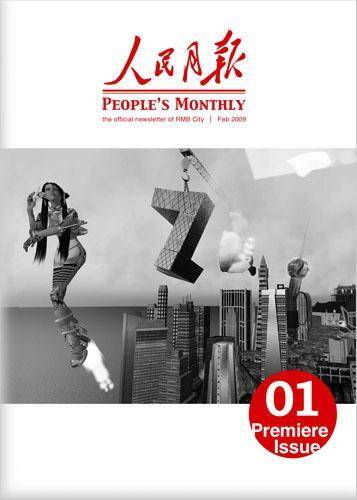 The debut issue of People’s Monthly will hit the street in March … stayed tuned to the RMB City blog for more updated info. Obviously in real-life, we don’t assume our names are completely unique (depending on how common they are, we may share them with literally millions of other people). But in Second Life, with names as outlandish as Tuna Oddfellow and Gazira Babeli (it really feels like a Charles Dickens novel sometimes), it seems more likely that our SL names might be one in a million. Of course in real life, I just realized, we don’t get to pick our last names either… Linden is just doing what our parents have for us already, narrowing the field of our possible name-based identities. It seems only natural to want to “metabolize” such an epic-scale disaster by shrinking it to the level of the cute, or distancing it via the lenses of narrative and myth. Maybe such a catastrophe provokes the need to take more “authorship” than normal over one’s city (as demonstrated here, in a very light-hearted manner). Obviously since there was very little loss of life, it doesn’t feel like a “human tragedy” — more a tragedy of inanimate objects and systems. We know so little about the secret life and emotions of glass and steel. 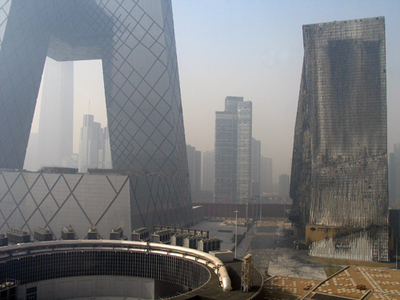 Does the urban fabric of Beijing itself feel the “burn”? On Monday evening, I was driving home in a taxi along Beijing’s 3rd Ring Road (in Real Life), when the traffic began to slow down… It was the final day of the Lunar New Year, also known as “Lantern Festival,” and hence the night when all of Beijing would attempt to set off as many fireworks as possible before they became prohibited again the next morning (and until the next turning of the Lunar Year, which would briefly make the city a flashing kaleidoscope once more). The evening was full of bang, sparkle, and pop in all directions, many revelers young and old standing on street corners to enjoy the show, but then as we approached the CCTV building, the crowds grew bigger and the cars ground to an almost halt. The taxi driver exclaimed that there must be a fire, and urged me to look out the left-side (Eastern) windows of the car. 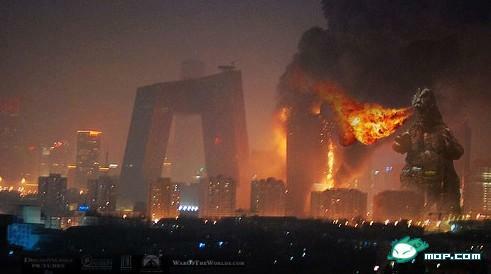 Sure enough, I saw small flames and huge black smoke clouds billowing out of the top of the tall building next to CCTV. He said, “I’m sure this will be in the newspaper tomorrow.” Only a little while later, the entire building was burning – as I continued to watch via my laptop at home. 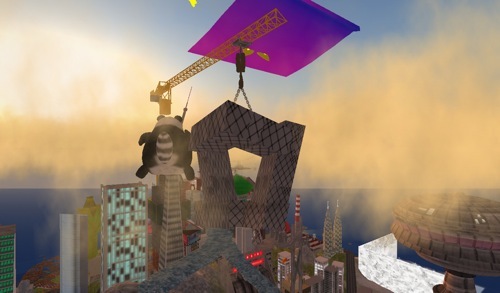 Of course, RMB City has its own People’s Entertainment Television Center, gently spinning in the air above our Sims, untouched by any threat of spreading sparks. It’s amazing to remember, on such a huge scale, just how fragile a platform First Life is. A nice essay by Bert de Muynck on Artforum China gives more reflection on the real-life icon, and its place in the ever-changing symbolic weather of Beijing. 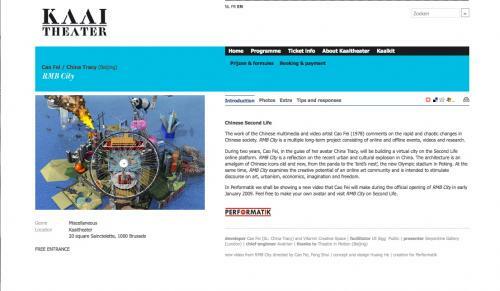 RMB City is going to be shown at Performatik 09, a Kaaitheatre festival that will be taken place from 13 Feb to 21 Feb, 2009 in Brussels, Belgium. Focusing on “work founded on exchange and collaboration between disciplines”, this fiesta of art happenings stresses an element — live event. Under this topic, concerts, performance art, live art, body art … are going to blow the audiences’ minds. Among tons of programs/works by accomplished artists including Stelarc (you probably have seen his “third ear”) and Lawrence Weiner, RMB City will be shown at performatik on 13, 14, 18, 19, 20, 21 Feb 2009 (Brussels Time). 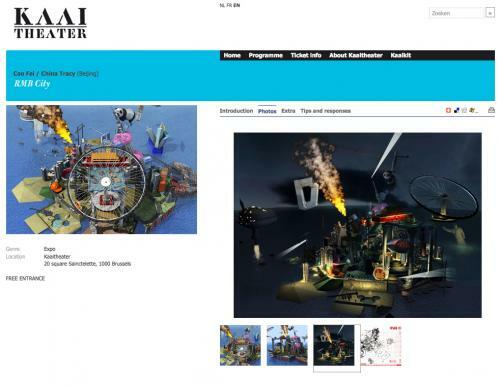 Apart from the visual/ sociological/ art discourses and amzaing virtual architectures, Master Q, a.k.a Guangzhou-based artist Huang He (SL: queenShoe Voom) ‘s virtual fengshui project is definitely a highlight of RMB City — the SL fantasia developed by artist Cao Fei (SL: China Tracy) and Vitamin Creative Space. Art-goers! Prepare for the new eye-blinding journey through the pixels! 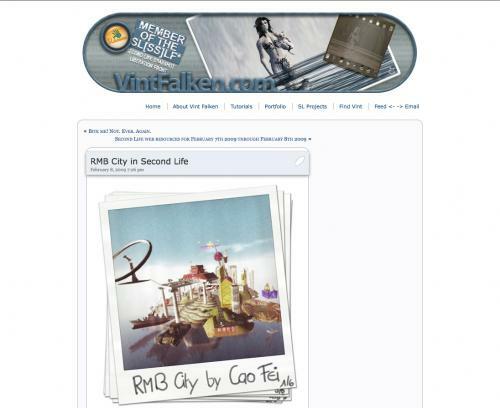 Just saw an article RMB City in Second Life VintFalken.com, a website offers news of games about sanpshotting, building and designing. I was fascinated by the polaroid-esque pictures they took inside RMB City, and their understanding about city – “fragments of lives”, more than a whole set concrete blocks mass-produced by some famous architects. 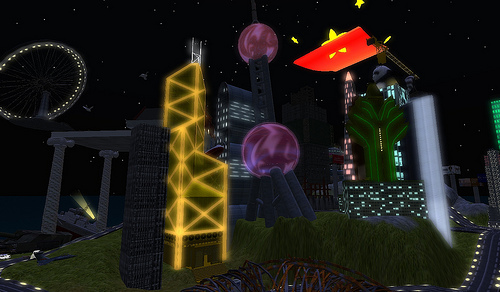 At RMB City, there is just one thing that makes that this virtual urban area does not qualify fully as a city, yet. 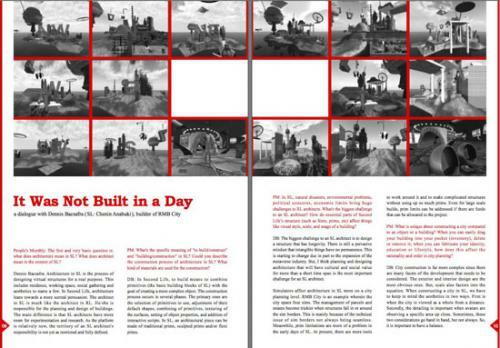 Despite all city planning, in real life, never does one person, or only a few, think out a city. It’s a collection of little pieces of lives… your life, that of your neighbours, that of your colleagues, that of the stranger on the bus, a kid going out for ice cream … . RMB City has not been “lived” yet. There are no marks of use: a road worn down, buildings that tell history, graffiti on the bus, a thrown away bottle, little advertisements with phone numbers on them or even worn down flowers for the kid that wanted the ice cream so badly it didn’t look before crossing the road. Some might call this all “decay”, but it’s exactly that contamination by life which makes a city interesting to me. I hope, that as RMB City progresses, we get to see exactly that, fragments of how life in this city could be. Read more on RMB City at rmbcity.com (press connect to enter the site) or go see for yourself in Second Life (TP link or search for “RMB City” using the Second Life Map). 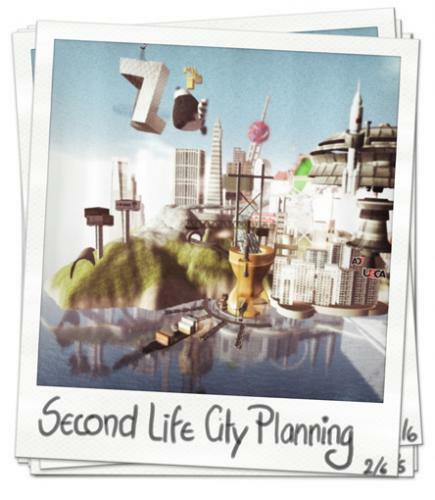 And if you have figured out how your life this “virtual but real” metropolis would be like, write them down, illustrate them with snapshots and share the story, as I’m dying to know how it is to live here and how the city will look once it’s “used”! 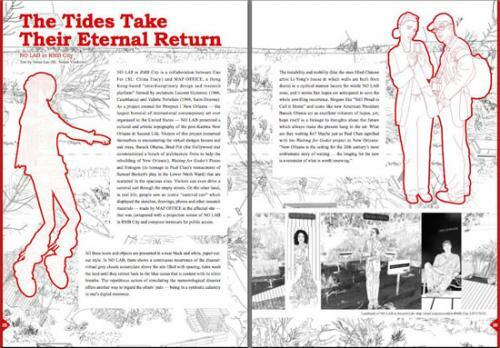 Writer/ critic/ designer Hrag Vartanian wrote an interesting article aboout Prosepct New Orleans, the biggest among the art biennales that have taken place in the United States. Starting with Mark Bradford’s piece – an ark called “Mithra” (2008), Vartanian commenced his journey of wandering amongst the art pieces in the post-Katrina New Orleans. I have always been particularly drawn to the People’s Observation Wheel in RMB City, and when I thought about this phrase again it clicked for me. Though the City Hall appears to be the main center for RMB City, it seems the wheel might be an important fulcrum as well. 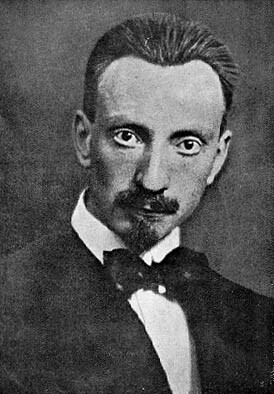 I then remembered the phrase “Axis Mundi”, and how nearly all world cultures have their own version of this. The still point that connects heaven and earth. The eternal, unchanging center of a swirling chaos.